Alt Thai News Network ATNN : Thailand: Who are the Anti-Regime Protesters? Thailand: Who are the Anti-Regime Protesters? UPDATE - April 1, 2014: Below the original article, readers will find an updated enumerated list of the protesters' goals, including updates since December 2013 regarding progress made toward achieving these goals. 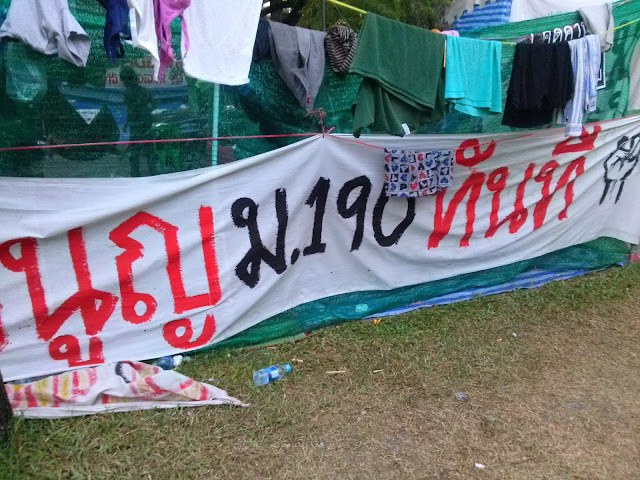 December 3, 2013 (Tony Cartalucci) - After clashes with police in Bangkok and the taking of several government buildings, anti-regime protesters prepared for the next phase of their resistance - the protracted encampment of key governmental centers. Thousands of protesters are now permanently entrenched in an area winding for nearly a mile through the capital city. They have built up a city within a city at three main locations that are linked by the constant stream of protesters coming and going to and from the protest sites. Image: It appears that the anti-regime protesters know exactly who they are dealing with. While it is easier in speeches and sound bites to describe Thaksin Shinawatra and his hereditary dictatorship as the central source of Thailand's problems, it is well understood amongst protesters that a vast network of foreign-funded NGOs are propping up the Shinawatra regime. Freedom House, for instance, lists as a trustee Kenneth Adelman, who concurrently served as Thaksin's lobbyist. Pro-regime news website Prachatai, is directly funded by US State Department NGOs such as the National Endowment for Democracy (NED). But who are these protesters and what do they want? Are they, as the Western media portrays them, anti-democratic elitists who refuse to to concede power to awakened rural masses? 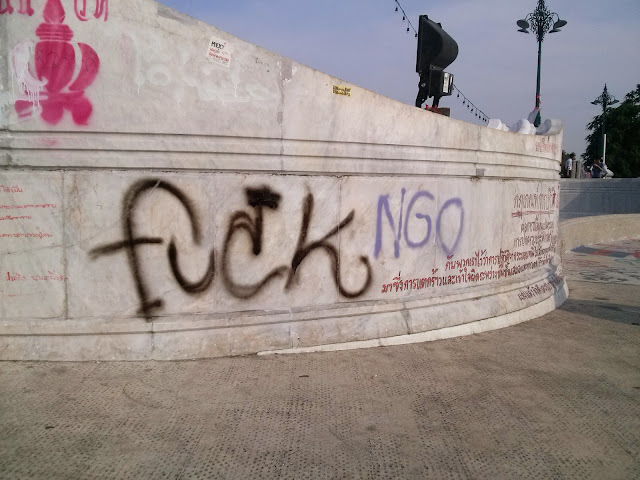 Or are they dangerously informed, socially and politically aware groups that are actively opposing the designs of foreign corporate-financiers and the proxy regime they have put into power in Thailand? Who are Thailand's Anti-Regime Protesters? Walking from one end of the protest to the other can become an all day affair. The sites are spaced out slightly, but occupy long stretches of road turned into permanent encampments complete with food, water, medical services, bathrooms, shower stalls, exhibition booths and support points, media centers, stages, and hawker stalls. There are thousands of permanently encamped protesters and thousands more who come and go - even at low points in the day. The extensive infrastructure of these protest sites resemble a fair or an exhibition. While a single theme has brought them together, a large number of diverse groups have marshaled their resources to build the sprawling encampments. There of course is the main camp and stage set up by a group of political parties including the main opposition party, the Democrats, the People's Democratic Reform Committee, and the Network of Students and People for Reform of Thailand. The "Yellow Shirt" People's Alliance for Democracy (PAD) also maintains a camp, as does Santi Asoke, a group that practices the Thai-equivalent of organic farming, homesteading, and grassroots community development. Images: Labor unions have a strong showing in the anti-regime camps. 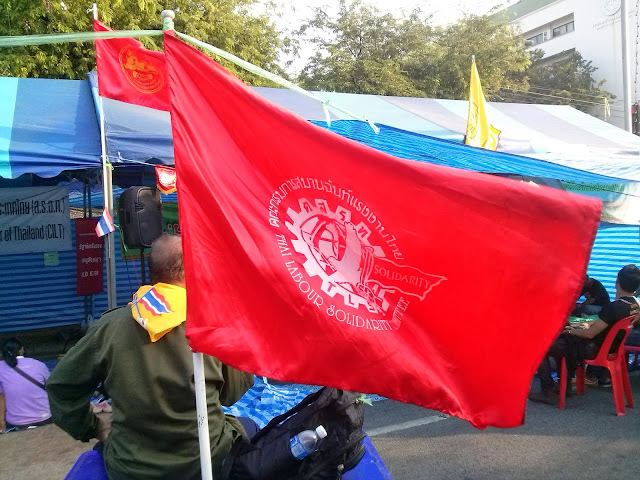 While the Shinawatra regime has hijacked the color red for his mobs as well as the socialist rhetoric that goes with it, real labor unions flying the color red actually engage in the protection of workers' rights. 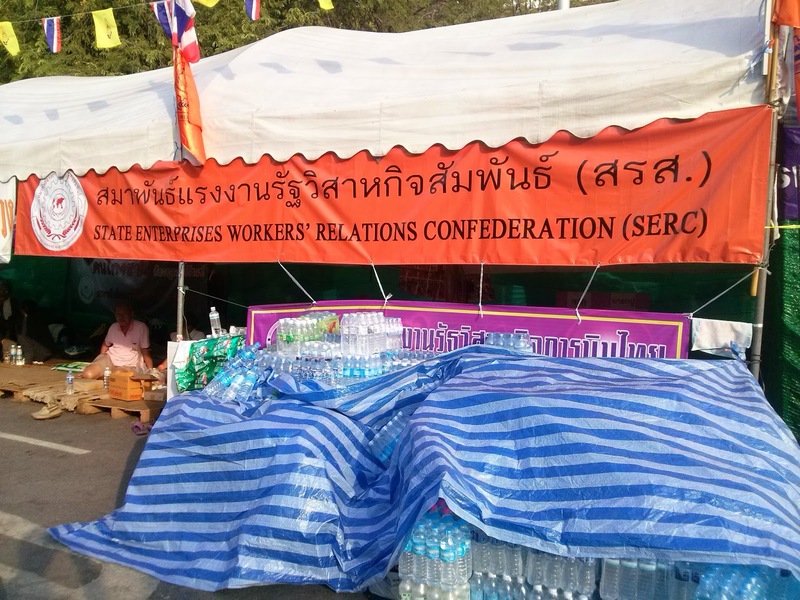 There are throughout the camps, smaller student groups from across Bangkok, and a large number of labor unions. Some of the bigger unions include those working for state enterprises, THAI Airways, and the country's nationalized telecom company, CAT. And despite the most vitriolic and perhaps even racist accusations leveled against the protesters is that they represent ethnic Chinese-Thais. While there certainly are a lot of Thais of Chinese descent at the rallies, mainly because they have called Bangkok their home for generations, still the vast majority of the protesters are ethnic Thais and include people drawn to the capital to find better lives from Thaksin Shinawatra's northeast political stronghold. We are told by the Western media that this is a "people's coup," an attempt to overthrow democracy. In reality, and entirely unlike Thaksin's red shirts who simplistically demand "democracy," the anti-regime protesters have a list of cogent demands. 1. No Amnesty - This refers to an amnesty bill designed by and for Thaksin Shinawatra to absolve himself of a decade of plundering, lying, and mass murder. While the government eventually backed off, it was only because massive street protests were mobilized. When the Constitution Court declared the bill unconstitutional, the ruling regime announced that it no longer recognized the authority of the court - even while using constitutionality to condemn the protests. Even though it is considered "dead," Thaksin's entire future depends on it eventually passing. Protesters feel the only way to truly kill this bill, is to remove entirely the regime attempting such an absurd abuse of power. 2. Rollback Article 190 - Article 190 of the Thai constitution requires that all treaties be approved by the parliament before they can be signed. In 2004, this mechanism had prevented Thaksin Shinawatra from unilaterally passing a US-Thai free trade agreement, and was one of many attempted circumventions of the law that led to his ouster in 2006. His nepotist-appointed sister Yingluck Shinawatra, has now managed to amend it making it possible for her to unilateral approve treaties (specifically unpopular FTA's). Protesters would like to see this reversed. 3. The Re-Nationalization of Thailand's Oil - Thailand's oil giant, PTT, was privatized and sold off to foreign multinationals under Thaksin Shinawatra in late 2001. Tremendous wealth has been siphoned out of Thailand and sent overseas, particularly to Chevron, one of the many sponsors on the US-ASEAN Business Council that directly supports the Shinawatra regime. Image: Another issue protesters have is with the changing of article 190 which allows the regime to now unilaterally sign treaties without the parliament's approval. This will be used specifically to pass through a series of extremely unpopular free trade agreements with the regime's Western sponsors. 4. Keep Thailand Anti-GMO, Anti-IP - The current Thai establishment resisting the regime has been stalwartly defending against GMO and "intellectual property" (IP) laws pushed on them by the United States, the UK, and the EU. In fact, one of the main points of attack by Thaksin Shinawatra's Washington lobbyists, was attacking the military council that ousted Thaksin for ignoring US pharmaceutical patents while producing cheaper drugs for poor patients. Regarding GMO, Monsanto has been desperately trying to overrun Thailand's food security but to no avail. Would it surprise readers to know that the US-ASEAN Business Council directly supporting Thaksin Shinawatra and his political machine also includes Monsanto? It becomes abundantly clear why corporate media houses like the BBC, Reuters, AP, AFP, CNN, MSNBC, and Australia's ABC have attacked the protesters as "anti-democratic," "elitist," and "violent." They represent for them a population they cannot trick, manipulate, and have their way with. They would like to see it marginalized and removed from Thailand's political landscape so they can grind Thailand into the ground like so many other nations across the developing world. Thailand's anti-regime protesters are making their stand - those that support true freedom and progress should stand with them. Update - April 1, 2014: Since December 2013, much progress has been made toward addressing the protesters' demands. Additional grievances have also gained prominence including the failed so-called "rice pledging scheme" that has left thousands of Thailand's farmers cheated, destitute, and desperate. Below is an updated, enumerated list of what Thailand's protesters are demanding. 2. Reform Before Elections - Elections on February 2, 2014 were heavily opposed primarily because the current ruling regime headed symbolically by Prime Minister Yingluck Shinawatra, is in fact and quite openly, run by her brother, Thaksin Shinawatra. Thaksin is a convicted criminal sentenced to two years in prison currently evading arrest and running his political party as a fugitive from abroad (generally in Dubai, United Arab Emirates). The opposition demands that the loopholes used by the regime to continue this untenable and universally unacceptable arrangement be closed, and the unwarranted impunity the regime has used to exploit these loopholes be stripped away. On February 2, 2014, record low voter turnout, with over half of eligible voters boycotting the sham elections, signified the end of the perceived "popularity" the regime has attempted to hide behind for years. While the regime is attempting to prepare for another round of elections, the protesters' demands still stand - reform before elections. 3. Rollback Article 190 - Article 190 of the Thai constitution requires that all treaties be approved by the parliament before they can be signed. In 2004, this mechanism had prevented Thaksin Shinawatra from unilaterally passing a US-Thai free trade agreement, and was one of many attempted circumventions of the law that led to his ouster in 2006. His nepotist-appointed sister Yingluck Shinawatra, has attempted to amend it in hopes of making it possible for her to unilateral approve treaties (specifically unpopular FTA's). The courts have since overturned the amendment - one of many victories achieved by the ongoing protests. 4. The Re-Nationalization of Thailand's Oil - Thailand's oil giant, PTT, was privatized and sold off to foreign multinationals under Thaksin Shinawatra in late 2001. Tremendous wealth has been siphoned out of Thailand and sent overseas, particularly to Chevron, one of the many sponsors on the US-ASEAN Business Council that directly supports the Shinawatra regime. Protesters would like to see PTT re-nationalized and the profits obtained from Thailand's natural resources spent for the betterment of all Thais. 5. Keep Thailand Anti-GMO, Anti-IP - The current Thai establishment resisting the regime has been stalwartly defending against GMO and "intellectual property" (IP) laws pushed on them by the United States, the UK, and the EU. In fact, one of the main points of attack by Thaksin Shinawatra's Washington lobbyists, was attacking the military council that ousted Thaksin for ignoring US pharmaceutical patents while producing cheaper drugs for poor patients. Regarding GMO, Monsanto has been desperately trying to overrun Thailand's food security but to no avail. Would it surprise readers to know that the US-ASEAN Business Council directly supporting Thaksin Shinawatra and his political machine also includes Monsanto? 6. The End of the Rice Pledging Scheme - The regime of Thaksin Shinawatra conceived in 2011 the so-called "rice pledging scheme," a vote-buying ploy that promised an unsustainable over-market price per ton for rice. By the summer of 2013, the program was bankrupt and promised subsidies were first slashed before payments were halted altogether. Thousands of farmers have turned in their rice and have gone well over half a year without being paid. Much of the rice has gone rancid, so the option of seizing back the rice and selling it themselves, even for lower prices is not possible. Protesters seek immediate relief for cheated farmers and solutions to improve their lives in the long-term through self-sufficiency rather than unsustainable vote-buying handouts.